What is Frank Ross’s Positive vision for Edinburgh? Of course Frank Ross could have used his opinion column in the Evening News to outline the SNP’s positive vision for Edinburgh. He could have outlined the extent to which his party has been cutting Edinburgh’s budget year-on-year. He could have detailed how the reorganisation of Police Scotland in Edinburgh resulted in a house breaking epidemic. He could even have spoken about how his party want to take Edinburgh’s schools, some of which are the very best in Scotland, out of the control of local democracy. One can only guess why he did not what to talk about this. Instead, he opted to question the “Scottishness” of his political opponents in an effort to further divide families, friendships and workplaces with the worst kind of nationalist rhetoric. Well I’ve got news for Mr Ross, I’m proud to be Scottish, I work every day to make Scotland a better place and I’m standing as Scottish Labour’s candidate in Colinton-Fairmilehead (Edinburgh). 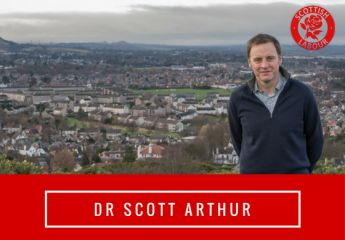 When I speak with voters in places like Firrhill and Colinton, the last thing on their mind is where I was born. Instead, they want to hear my positive vision for their community. The truth is though that it’s not my birthplace that Mr Ross really has issue with. It’s the fact that I believe that Scotland remaining in the UK is the best way to ensure every Scot has the chance to reach their full potential. I fully understand that Mr Ross has a right to disagree with me. All I ask is that he shows all candidates in the forthcoming election the same respect that I offer him. ← Gordon MacDonald MSP tries to shift the blame on job losses at Heriot-Watt University.